An initial assessment of the shuttle Atlantis' heat shield gives mission managers "high confidence" the spaceplane completed its climb to space Saturday without any potentially dangerous debris impacts, officials said today. John Shannon, chairman of NASA's Mission Management Team for orbital operations, said the results of a detailed analysis of ground imagery, radar data, shuttle inspections, wing leading edge sensor data and photos shot from the space station during final approach Monday will take several more days to complete. But so far, it would appear what little foam that did fall away from Atlantis' external tank during launch did so well after the shuttle had climbed out of the dense lower atmosphere where debris can attain the energy needed to damage the ship's heat shield. "We make a decision at the end of our first MMT on whether the thermal protection system is suspect or not," Shannon told reporters today. "And the decision this time is that it is not. That was based on our quick-look review of the imagery, the fact that we had nothing in our aerodynamically sensitive time and the initial look at the leading edge and the nose cap. So right now, I have high confidence in the thermal protection system." After launch Sunday, engineers identified two potential foam shedding incidents at four minutes and five seconds after liftoff and at five minutes and 28 seconds. 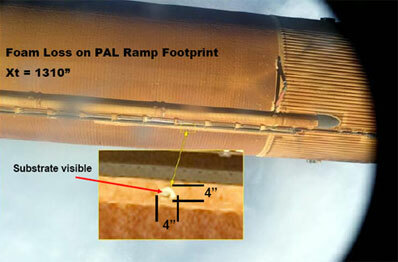 Shannon today showed photographs of the external tank after it was jettisoned in space showing one 4 X 4-inch area of foam loss from an area that had been repaired before flight. 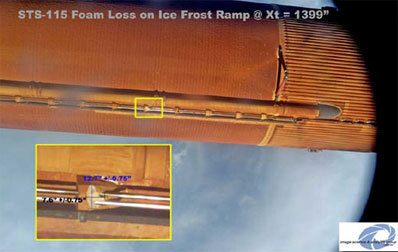 A small amount of foam from one of the tank's so-called ice-frost ramps also was missing, along with insulation in two other areas near the tank's cable tray. 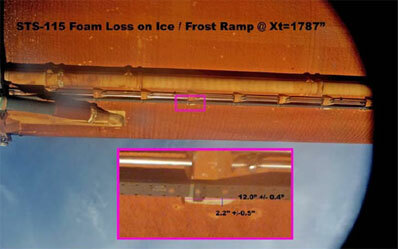 NASA currently is redesigning the ice-frost ramps to reduce the amount of foam needed to prevent ice from forming around brackets holding two pressurization lines in place. The ramps are made by pouring foam into molds on top of existing foam and post-Columbia research shows such foam-on-foam buildups are susceptible to cracks. Even so, Atlantis' tank looked very good to the untrained eye and Shannon said it appeared no foam came off in the time that is the most dangerous, when the surrounding air is dense enough to slow a piece of debris fast enough that the shuttle can slam into it at a high relative velocity. "We saw no debris at all that came out in our critical time periods," Shannon said. 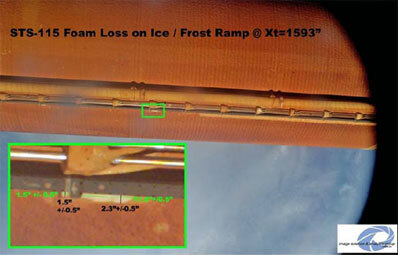 "All the foam we saw lost was after what we call the aerodynamically sensitive transport time that ends at 135 seconds. The first piece of foam we saw come off was after four minutes. So we're in good shape there." That's not to say engineers don't have interesting data to digest. A C-band radar detected a return from something that apparently separated from the spacecraft 330 seconds after launch. Nothing shows up in camera views and it's not yet clear what might have generated the signature. In addition, data from wing leading edge sensors detected a 4-G spike just 14 seconds after launch. Again, nothing visible could be seen striking the panels in question. It may simply be the result of leading edge components, which are designed to have a bit of play in them, snapping into place under the stress of launch. A similar spike was seen during Discovery's flight in July, although the magnitude was smaller. Otherwise, Shannon said, "Atlantis looks great" and flight controllers are only troubleshooting a handful of minor glitches. One of four redundant power channels that drive the shuttle's rudder/speedbrake exhibited unexpected behavior during launch and may need to be isolated for re-entry. And a few microswitches that indicate whether the payload bay doors are open or closed appear to be stuck, but the astronauts can easily bypass the suspect data. Again, Shannon said, no problems are expected. And with that, the stage is set for rendezvous and docking with the international space station Monday and the installation of a 35,000-pound $372 million solar array truss that will signal the restart station assembly after a three-and-a-half-year hiatus. "The bottom line is, we have a really good start to this very complex mission," Shannon said. "The team certainly has their game faces on. They understand the rendezvous tomorrow with the EVA (spacewalk) the day following, it's going to be a really big day for the international space station, it's going to be a very challenging day for the crew and the ground team."